Whatever it is, He's still good. Children aren't born thankful. After all, adults struggle with thankfulness; we often feel we deserve good things. We're selfish and we want what we want. Yet we're often disappointed and think gratitude only applies to happy times. But God has made it clear that expressing gratitude is not optional or occasional&dash;and that He takes our lack of faith, expressed in complaining, very seriously. Our circumstances leave us with choices: Will we focus on ourselves or God's character? Our short-sighted plan or His perfect, all-seeing faithfulness? Gratitude is neither easy nor quick. But it can be taught&dash;and inspiring role models can lead us there. The heroes who step from these pages motivate us to follow. They possessed the courage to deny self-pity, believing in God and His loving interest in their circumstances. Their true stories will capture your family's imagination and hearts, granting vision and role models who will redefine contentment, trust, and thankfulness for everyone around your table. Encounter real-life heroes right in your living room&dash;and begin to grow together in character as a family. 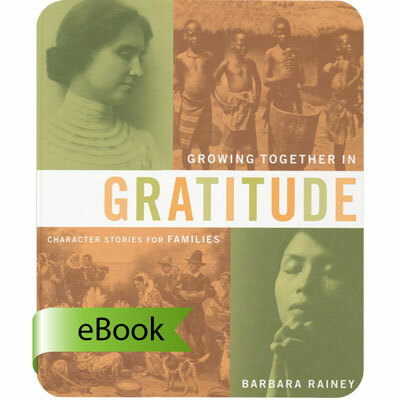 Growing Together in Gratitude is part of The Character Stories for Families Series: Heart-changing history.